The L.A. show differs from other domestic auto shows in that it's not owned by a dealer association. Editor's note: Fiat is expected to unveil its Spider at the show. The brand was incorrect in an earlier version. LOS ANGELES -- Promising equal parts traffic, sunshine, new cars and technology, next month's L.A. Auto Show will feature 30 global new-vehicle debuts, organizers said today. The 2015 event will kick off with the Connected Car Expo on Nov. 17, followed by two press preview days, Nov. 18-19. It will be open to the general public Nov. 20-29. 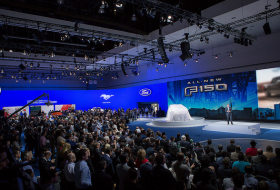 “This year’s news comes from many sources, and it’s fascinating to witness the dramatic and swift changes that are transforming the automotive business,” Lisa Kaz, the show’s president, said in a statement. Key vehicle debuts already confirmed include Buick’s all-new LaCrosse sedan, a convertible version of Range Rover’s Land Rover Evoque, a new 2016 Nissan Sentra, Porsche’s GT4 Clubsport, and Mitsubishi’s 2017 Mirage and 2016 Outlander Sport. Other anticipated introductions: Fiat's Spider (a two-seat roadster based on the recent Mazda Miata), a new Mazda CX-9 crossover and a small Scion crossover expected to foreshadow a production model due next year. Ford, Mercedes-Benz, Subaru, Volvo and Volkswagen will have global debuts, details of which will be disclosed at or just ahead of the press previews. The 2015 L.A. show will also mark the North American debut of a number of German vehicles initially shown at the Frankfurt Auto Show in September and Japanese vehicles from next week's Tokyo Motor Show. All told, including the North American unveilings, the show will feature more than 50 debuts. But the event won’t just be about shiny new cars. Organizers of the 2015 L.A. show are looking to highlight the rapid convergence of the auto industry itself and technology. With this in mind, more than 40 exhibitors will showcase new technologies aimed at safety, connectivity, data gathering and efficiency. This includes tier-one suppliers such as Garmin, Faurecia and Qualcomm. With emerging tech making factory-direct, over-the-air updates and servicing possible, the Connected Car Expo also will focus on what this means for dealers. Car sharing companies and services will also be a hot topic, and John Zimmer, the co-founder and president of ride-share company Lyft, will be the keynote speaker the morning of the expo. This independence allows the show to take a greater look at practices and companies pushing change in the automotive industry that might otherwise be excluded from such an event.